Q: Over the course of your career, what roads led you to Eagle Rock School? A: Growing up, I went to a public high school, then went to Slippery Rock University in Pennsylvania. I didn’t want to go to college. I lost my father when I was 15 and was adrift in knowing what I wanted to do with my life, but my mom talked me into trying college for a semester. I had always been really interested in the outdoors, and I associated college with sitting at a desk, so I had a hard time imagining there would be any value in that. But, when I went to Slippery Rock, I took a class in Resource Management and Parks and Recreation. All of a sudden, a new world opened up for me about what I could do with my life. I eventually met Paul Petzoldt, the first chief instructor of Outward Bound in the U.S. and the founder of the National Outdoor Leadership School. I had a conversation with him when he visited and spoke at Slippery Rock, and he invited me to come to Wyoming to do an internship with the Wilderness Education Association for the summer. My life continued to unfold in really interesting ways as I explored outdoor leadership and leading wilderness trips. After my internship in Wyoming, I came back to Slippery Rock, graduated, and got my first job working with adjudicated youth in Georgia in a wilderness program that acted as an alternative to lockup. Three years of that introduced me to the reality that there is a whole slice of this country that is underserved, misunderstood, and has so much potential and value if given the right context, environment, and support. I went ahead and pursued a graduate degree with a focus on outdoor and experiential education and management. From that first trip to Wyoming until I landed at Eagle Rock, I spent 17 years working in some form of outdoor education context. Over those years, my experience as an outdoor and experiential educator grew, as well as my expertise in guiding character and leadership development. When I came to Eagle Rock, I ran the Wilderness Program for five years—a 24-day, new student wilderness orientation course that happens at the beginning of every trimester. This position is what originally brought me to Eagle Rock, but what really drew me to the organization was this idea that a wilderness program could fit inside the context of a school. That doesn’t occur often, and I found a great deal of interest in that. I would work with these students for 24 days in the field, and then I would have another couple of years with them back at the school to see their growth and development. Most other outdoor programs sort of stand on their own. You take their course and go back to wherever you’re going. The other piece that inspired me was Eagle Rock’s Professional Development Center. We not only want to serve the 72 students on our campus really well, but we also want to have a bigger impact around the country. That was really intriguing to me. I was at a point in my career where I wanted to be working with young people but with a bigger impact. It always seemed this was an either-or dilemma. You’re either working for an association where you’re putting on conferences and creating professional development experiences but not working with young people; or, you’re working with young people and not having this broader impact. Eagle Rock had both. I eventually became the Director of Curriculum, a position I held for seven years. Using my experience as the Wilderness Lead, I wanted to find a way to integrate the skills and lessons learned on the expeditions with the academic curriculum in a more holistic way. The curriculum at Eagle Rock started out really innovative when it opened in 1993, but it started to drift toward a more traditional framework. When I took over as Director of Curriculum, we revamped the curriculum and reorganized it around our original values. We changed our daily schedule to allow for larger chunks of time, so our learners could do more field- and service-oriented work in the community. For the last five years, I’ve acted as the Head of School, which puts me in charge of the school and the professional development center. Q: Can you share more about how Eagle Rock School’s curriculum has shifted over time? A: We have a set of values captured in the phrase, 8+5=10. The eight stands for the themes that guide our design, the five for the expectations we organize our curriculum around, and the ten for the commitments learners are living out through their experience at Eagle Rock. So, it was those five expectations that originally guided our curriculum design. When you looked at our graduation requirements, you had to earn credit in effective communications, making healthy life choices, practicing leadership for justice, being an engaged global citizen, and developing an expanding knowledge base. That’s how you graduated. Baked inside was your math, science, and English, but that wasn’t front and center. These graduation requirements are core to our Individualized Learning Plan (ILP). Over time, as the ILP framework went through multiple revisions, the traditional disciplines became more prevalent. Rather than the five expectations operating in the foreground as intended, they took a backseat to the siloed subjects. Eventually, the five expectations stopped showing up on the ILP altogether. Everything was grouped by math, science, history, etc. The courses were still operating in an interdisciplinary fashion, but they didn’t have our values. It was morphing toward this discipline-centric orientation. That made it harder and harder to operate with an integrated curriculum. Students felt they were simply taking math class or science class, rather than feeling like they were learning some overarching concept that required them to draw on different disciplines in a natural way. One of the things we started to see was students getting hung up on the idea they didn’t like math, and that barrier would cause them to up and leave because they couldn’t get the number of math portfolios needed to graduate. They weren’t as engaged because the curriculum wasn’t as integrated or innovative. I think one of the big things in our shift back to focusing on the five expectations was that the instructors felt like the things they wanted to do—and felt the students wanted to do—were no longer possible. Given the traditional route the curriculum had begun to take, they had to get through all of this “stuff.” We were able to resurface our five expectations and re-emphasize the holistic nature of our curriculum through the support of the instructors and students. In terms of how this shift away began in the first place, I wasn’t at Eagle Rock while it was happening, so I can only speak to what I’ve been told. What I’ve understood is that each time a revision was made to the ILP, it was like the House of Representatives—everyone wanted to add one more item from their discipline. This caused an inflation of the checkboxes that needed to be filled in throughout the year and a move away from our work to create a holistic experience for the students. I think this is a natural occurrence in many alternative or progressive environments. I think a lot of people who are drawn to progressive education are drawn to it from a philosophical perspective. But, they have been successful in a traditional environment. The longer they’re in an environment like that, the more their professional insecurity grows when they begin facing questions they don’t necessarily have the answers to. When you have this predominant paradigm that tells you to organize your curriculum by discipline, using scope and sequence, you develop a belief that if you don’t do that, your students are going to die. When push comes to shove and you’re in uncharted territory, you tend to gravitate toward what you know. I think many innovative schools that start out really cutting edge get fearful over time, and ask themselves if they might need to pull back and reimplement old techniques. Q: What is the long-term impact of the wilderness expedition learners embark on as their introduction to Eagle Rock School? A: It’s fundamental in a way. I always tell people, I can’t imagine this piece of Eagle Rock ever going away. I can almost see every other aspect shifting or changing but not the expedition. One reason for this is the fact we get our students from all over the country. They are disengaged, and the schools that served them did not serve them well. That can be for a whole host of reasons—the individual student and their learning style might be incongruent with sitting in a classroom; it could mean the student is growing up in a family system that is not conducive to them being successful in school; or, it could even mean the student is in a school that is poorly performing even by traditional standards. Also, some of our students have experience in the juvenile justice system, having engaged in criminal activity or participated in using drugs and alcohol. The students at Eagle Rock come from a host of backgrounds, creating a diverse mix of experience, race, culture, and gender. All of these students show up at Eagle Rock with all the coping skills that have helped them survive whatever context they’ve been in. And, those coping strategies aren’t usually conducive to living in an intentional, residential community. It can be a real mess when they show up—they’re struggling and acting out in ways that can be dysfunctional for the community. So, we go out for 24 days on the course to help strip away all their external influences. If we only had a one-week expedition, students would be able to hold up their facade and not embrace their vulnerability. That won’t happen during a 24-day period. At some point, we’re going to get the real deal from you. We’re going to get to know who you really are, and you’re going to have to be vulnerable and open up in a way that allows you to shift your behavior. By the time you’re done with that course, you’re not just exposed to some new ways of thinking; instead, you’ve had a chance to work through what you came in with in a productive, positive way. For the expedition, we’ll have eight young people in the middle of the wilderness, and they have to figure out how to work together in order to travel on the course. It’s a skill-building oriented program, so we do a lot of work around effective communication, conflict resolution, and restorative practices to help them understand how to take responsibility for their actions and how to interact with people in a way that helps them sort things out. We believe conflict can be generative, and when it comes up, if you lean into it and utilize the skills we teach, you can generate a new future you couldn’t have imagined when that conflict first arose. Overall, we get students comfortable being uncomfortable. We get them comfortable as learners, being vulnerable, and taking responsibility for their own lives. I believe all of those things are critical for them to come to Eagle Rock and be successful. It gives them 24 days to create a frame of reference. They will refer back to their experiences on the course all the time when they’re at school. For example, many of our students like to blame other people for their shortcomings. Wilderness has such a clear, natural, and logical consequence built into the experience that students discover pretty quickly that they can’t blame anybody if they didn’t listen to how to put the tarp up when it rained and they got wet. This makes sense, right? But, there are so many arbitrary things in the world, and rules that don’t make sense to them, that they develop this habit of not taking responsibility. Oftentimes, there’s some legitimacy to thinking the system is working against you. 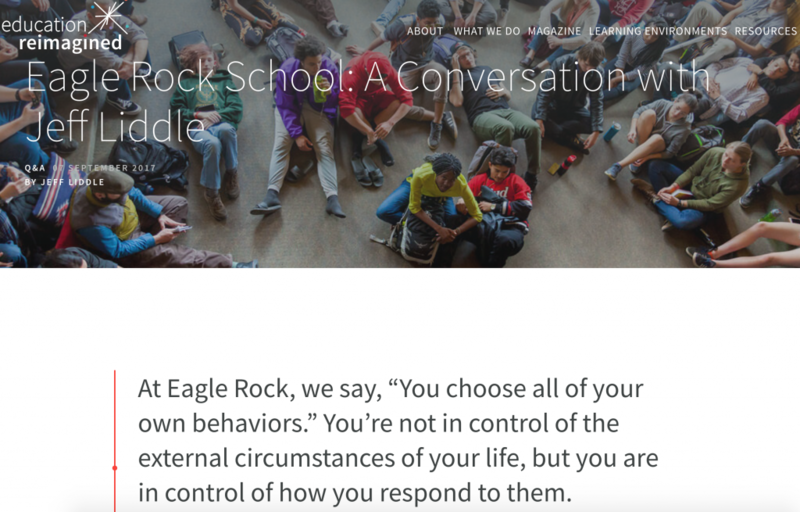 At Eagle Rock, we say, “You choose all of your own behaviors.” You’re not in control of the external circumstances of your life, but you are in control of how you respond to them. The wilderness trip really bakes all that in, which then facilitates their ownership of their learning when they’re back in school. When they’re struggling with something, we often ask, “What can you do to shift that? What is in your control that you can utilize to make your learning more yours?” The wilderness trip builds the foundation for that reflection to take place. Q: How do you see this wilderness orientation being translatable to learning communities across the country that don’t necessarily have access to something like an Estes Park? A: We realized a number of years ago that we can’t export Eagle Rock. We can’t tell a school in Albuquerque, New Mexico that they ought to be doing a 24-day wilderness expedition—let us help you design that. We’re so different, and in the early days, it caused people to easily discount our work, saying, “Oh, of course you can do that. You have this, that, and the other thing.” It was too easy for people to write us off. We took a step back and asked: “What are the paradigms working in community change models?” What we found was you have to listen more than you tell, build on what assets exist in that community, and support those organizations with their own goals inside their own contexts. We became focused on being context-specific, asset-based change facilitators more so than a group that says, “Let us help you adopt our model.” When we partner with an organization, we will make sure there’s alignment around a few things. The organization must show an aspiration to develop a progressive learning framework, and they must serve a demographic similar to what we serve. We like to work with larger networks, like Big Picture Learning. With so many deserving, underserved communities, these filters allow us to narrow our focus and make the largest impact we can. Having said all that, if a school came to us and said, “We’re really interested in taking your wilderness program and integrating it into our experience here, help us with that,” we would do that. But, we would begin with the community’s assets and see what already exists that would make this program possible. Something like helping form a partnership with an outdoor organization that already exists in the community and helping develop a curriculum around their program. When this isn’t an option, which is often the case, we look at the principles that capture the essence of the wilderness program and seek out multiple assets in the community that, when combined, can cultivate the full experience. For example, we might find an organization that offers a two-day ropes course experience that can get the wheels churning in incorporating that kind of experience into the curriculum. Overall, our real motivation is to help communities discover ways to orient young people to their school where they learn how to take risks and be vulnerable within a safe environment. That’s the bottom line of what the wilderness course is looking to accomplish. Q: What’s a story from your experience at Eagle Rock that captures the possibility available to learners who live and learn there? A: If I were to tell a story that captured the idea that who a young person is at a single point in time is not necessarily indicative of who they’re going to be, I would have to talk about Calvin King. Calvin King was interviewed to attend Eagle Rock while in lockup. I should mention, I always hesitate to tell these stories because, when I say “lockup,” people’s gut reaction is to think of our program as a place that is only serving students in the juvenile justice system. We certainly have young people who have been involved with the law, but everyone comes here by choice. When Calvin came to Eagle Rock, you could tell he was very street-wise, very charismatic, and could work the system. He got into some discipline problems at Eagle Rock and was disenrolled. He went home for quite some time because, when you get suspended from Eagle Rock, it can be for up to a trimester or two. Calvin was likely home for six months before returning. When students are suspended, they have tasks they must complete before re-enrolling in our program. These tasks are specific to each student and the actions they’ve committed—it can range from getting a job, seeking counseling, etc. Upon Calvin’s return to Eagle Rock, we held a restorative circle to repair the harm he had caused through his actions. He was reintegrated into the community with a lot of hesitation from students and some staff. But, he reintegrated, eventually graduated, and received a full scholarship to Morehouse College in Atlanta. After he graduated from there, he came back to Eagle Rock as a Public Allies Teaching Fellow for two years. Then, he went to the Christina Seix Academy in Trenton, New Jersey, where they focus on serving underserved youth. Calvin is the Director of Residential Life at the Academy. Calvin’s story really captures what Eagle Rock is all about and this idea that what happens today does not predict what will happen tomorrow. In his words, if Eagle Rock hadn’t shown up for him, he might not be alive right now. In his view, Eagle Rock saved his life in a lot of ways. From our viewpoint, Eagle Rock showed up at the right time for him, and through our school, he was able to save his own life. It was a process. He didn’t just show up, and it was all roses. He made some mistakes, we stuck with each other, and now he’s an amazing person doing amazing things—serving Trenton youth. We talk with all of our staff about this, particularly in instances when someone has convinced themselves a student will not be able to succeed here. We come back to that idea. We have to remind ourselves that what has happened in this moment is not predictive of what could be in a few years.